Martin placed a copy of the newly printed Ninety-Five Theses behind his letter to Albert, carefully folding the papers and sealing them with wax from his candle. There was a knock on the door and Martin’s friend Johann Schneider opened the door, ready and willing to stand beside Martin on the issue at hand. On the way through the Black Cloister, Martin arranged for his letter to be taken to Archbishop Albert, and then the two men strode through the garden, past the college where groups of students discussed theology and philosophy, continuing down College Street. As they passed the market square, Martin shook his head at the crowds of people who had traveled from all the Saxon lands to see the relics in the Castle Church on All Hallow’s Day. Martin knew that many would make their way from Wittenberg to find the monk Johann Tetzel so they could buy plenary indulgences that promised the forgiveness of their sins. Martin and Schneider passed the home of the famed artist Lucas Cranach before exiting Wittenberg through the Schlosse Gate, which cut a decorative gash in the high city wall. The priest huffed as they trudged up the boarded walk that led to the main north door of the Castle Church. In medieval Germany, the heavy wooden door was the city’s bulletin board. October 31st, 2015 marks the 498th anniversary of Martin Luther’s bold stand for the gospel–the day he nailed the Ninety-Five Theses to the door of Wittenberg’s Castle Church in Germany. This event in Christian history changed the course of the Christian Church, Germany, Europe, and–ultimately–the history of the world. Do your children know who Martin Luther is? My new book When Lightning Struck! The Story of Martin Luther is a narrative biography which tells his story from birth to death in an exciting manner. Young people will read about knights, castles, wars, a kidnapping, and more as they learn about history and theology. The book was written for young adults (middle and high school), and is also a great read-aloud for grades 3-5. You can find out more about When Lightning Struck! over at Thinking Kids. 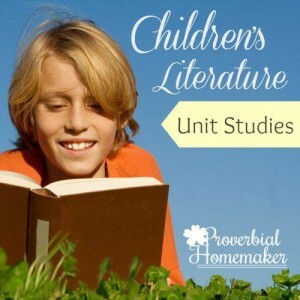 This extensive unit study for middle and high school students includes discussion questions, timeline dates (with an included timeline), related Scripture passages, and short biographies. Each week, students will study an assigned topic in history and science. Students can locate one of the suggested books at the library, or use the internet to hone their research abilities. Students will also have a weekly writing assignment, and an artist to study (five art pieces are presented each week for students to contemplate). Last, students will have vocabulary to write definitions for, and geographical information to locate on maps provided at the back of the unit study. Each week, there are a number of notebooking pages for students to record the results of their research. 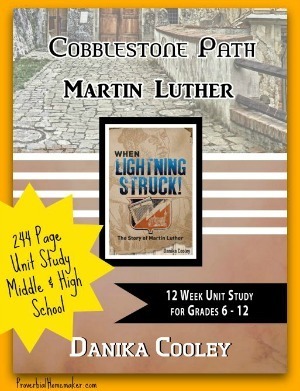 Lastly, students will have a weekly copywork assignment, which alternate between Scripture and quotes from Martin Luther. All Scripture copywork is provided in both ESV and KJV, allowing parents to choose the desired translation. I hope this study blesses you! You can find more information about When Lightning Struck! : The Story of Martin Luther at my little corner of the internet, Thinking Kids. You’ll find endorsements for the book, the back cover copy, and even a special offer if you pre-order the book before November 1st (so you’d need to hurry!). Again, if you would prefer a simple discussion guide for the book, that is also available free on the book page. God bless, friends, and happy studies! 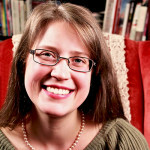 Danika Cooley is the author of When Lightning Struck! The Story of Martin Luther (Fortress Press, 2015), Wonderfully Made (CF4K, 2016), and Bible Road Trip. Her work has been featured in internationally-recognized children’s magazines over 150 times. Connect with her on Facebook, Pinterest, or Twitter.